The Washington Ocean Acidification Center serves the entire state from its base in the College of the Environment at the University of Washington. The Center was established by the Washington State Legislature following the recommendation of the Blue Ribbon Panel on Ocean Acidification. Created in 2013, the Center connects researchers, policymakers, industry and others across Washington to advance the science of ocean acidification and provide a foundation for proactive strategies and policies to protect marine ecosystems and the people connected to them. The Center is co-directed by Jan Newton (Applied Physics Laboratory, Oceanography) and Terrie Klinger (Marine and Environmental Affairs). How does ocean acidification affect Washington state? The amount of global carbon dioxide in our atmosphere. Upwelling of nutrient-rich—and often corrosive—waters off of our coast. High rates of plankton growth that ultimately reduce the oxygen content of local waters. Human activities causing runoff of nutrients and other pollutants from our watersheds and cities into Puget Sound and coastal waters. Industrial emissions of acidic gases other than carbon dioxide. In isolation, any one of these factors may not tip the balance—but when added together they make our waters more susceptible to ocean acidification. 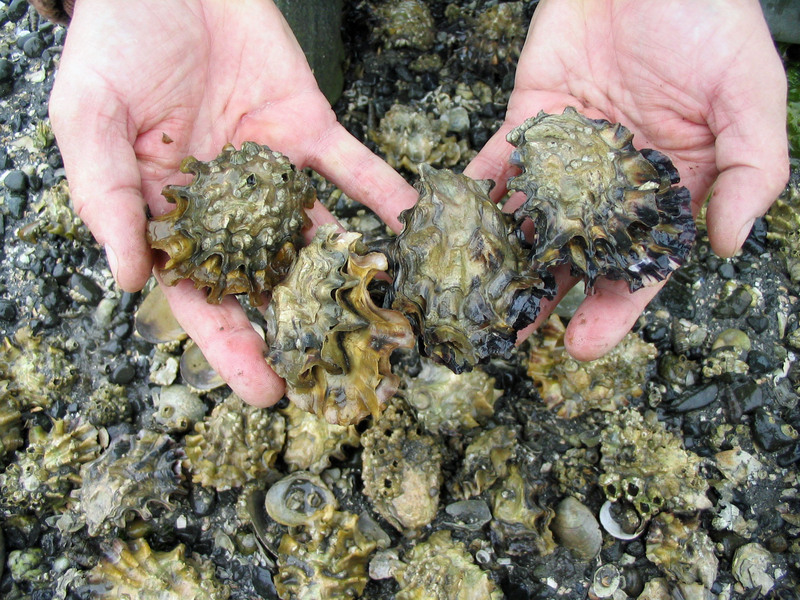 Read more about ocean acidification as it relates to marine water quality in Washington. What does the Washington Ocean Acidification Center work on? Establish an expanded and sustained ocean acidification monitoring network to measure trends in local acidification conditions and related biological responses. This monitoring will allow detection of local acidification conditions and increase our scientific understanding of local species responses. As part of the monitoring network, ensure continued water quality monitoring at the six existing shellfish hatcheries and rearing areas to enable real-time management of hatcheries under changing pH conditions. The monitoring data have enabled hatchery operators to avoid drawing acidic water into the hatcheries and rearing areas. Establish the ability to make short-term forecasts of corrosive conditions for application to shellfish hatcheries, growing areas and other areas of concern. A real-time online tool will be developed and accessible to shellfish growers and managers to track acidification on a scale of days to weeks, giving them time to change or adjust their hatcheries’ operation. Conduct laboratory studies to assess the direct causes and effects of ocean acidification, alone and in combination with other stressors, on Washington’s species and ecosystems. The studies will focus on determining the biological responses of species of ecological, economic and cultural significance, to a full suite of stressors to which they are exposed, and will help estimate the genetic potential of these species to adapt to ocean acidification. Investigate and develop commercial-scale water treatment methods or hatchery designs to protect larvae from corrosive seawater. 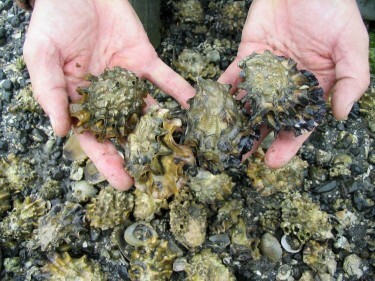 Scientists from the UW will help shellfish growers assess the effectiveness of the adaptation measures. Currently, live output from the forecast model “LiveOcean” and the real-time monitoring data from shellfish growers and many monitoring partners are available through the Northwest Association of Networked Ocean Observing Systems (NANOOS) at www.nanoos.org through the data portal NVS. engaging with industry representatives, state, local, federal and tribal policy makers, and public opinion makers through specific activities and through the formation of an advisory board and a science advisory team, both of which will be used to help guide the activities of the Center. The Center strengthens its work—both in terms of scientific rigor and application to real-world scenarios—through partnerships with federal, tribal, state and local governments, industry, regional colleges and universities and others. Many productive partnerships and collaborations already exist and more are emerging as we work to address this issue. The Washington Ocean Acidification Center will convene its Third Biennial Science Symposium on Thursday, May 30 at the University of Washington Center for Urban Horticulture in Seattle, WA. This day-long symposium will consist of invited presentations from regional experts. Presentations will focus on new results from research relevant to ocean acidification in Washington waters, including field observations, biological experiments and modeling. Presentations will be followed by plenary discussions and will offer numerous opportunities to enhance communications and strengthen regional communities of practice. There is no fee to attend, but registration is required. Please see the draft agenda for the symposium. For questions about Washington Ocean Acidification Center or ocean acidification in Washington state, please contact Jan Newton (janewton@uw.edu) or Terrie Klinger (tklinger@uw.edu). You can also contact the Center directly at woac@uw.edu.